The Resident Tourist: Democracy Plaza . . . This was my first time in New York for a Presidential election, and I can't deny that there is something incredible about being in Manhattan for big moments in history. The city just knows how to do things right - CNN used the top of the Empire State Building to display results. Times Square turned into a giant viewing party. 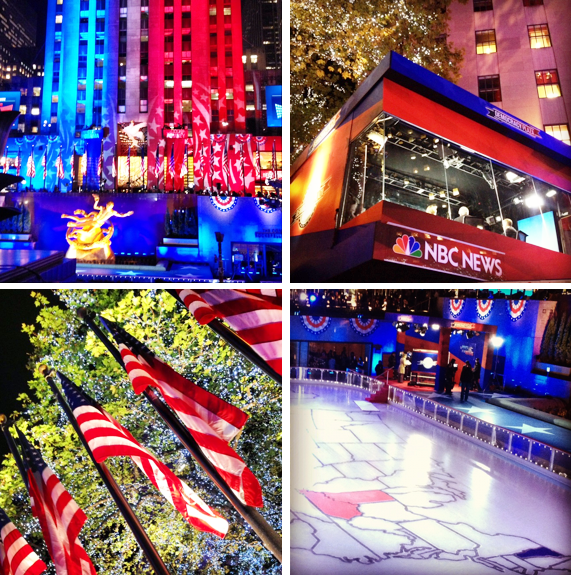 And NBC transformed Rockefeller Center into Democracy Plaza, with two temporary studios hovering above the crowd, a map of the United States projected on the ice rink, and curtains climbing 30 Rock as votes were counted.